NEW HAVEN — Residents participating in a gun buy-back program organized by the New Haven Police Department and several partners turned in 45 operable firearms and three that could have been made operable, including one assault weapon, police said Sunday. The police department organized the buy-back with Yale New Haven Children’s Hospital, the Injury Free Coalition for Kids and the Newtown Action Alliance, said police spokesman David Hartman. It took place over a five-hour span Saturday at the New Haven Police Academy. In five years of gun buy-back events in New Haven, police have taken in more than 600 guns, Hartman said. “We are encouraged by this recent buy-back and hope to keep our momentum,” he said. The guns collected “are scheduled for destruction per state protocol” and that means “they will never be able to fall into the hands of children, suicidal people and criminals,” Hartman said. A safety team working at the event also gave out free gun locks and provided gun safety information to those who wanted it, he said. “There are many people who deserve our thanks, but none more than the driving forces behind this and all of our past (gun buy-back) events,” Hartman said. He singled out Pina Violano, a manager at Yale New Haven Hospital in injury prevention, community outreach and research in emergency medical services for children who is co-director of the Injury Free Coalition For Kids of New Haven, and Steve Yanovsky of the Newtown Alliance. Hartman also thanked the Yale New Haven Hospital injury prevention staff. Officers Omar Thomas of the police department’s Firearms Division and Det. Josh Kyle, Officer Joshua Smereczynski and Sgt. Mary Helland catalogued each weapon and filled out the necessary paperwork to destroy them, Hartman said. 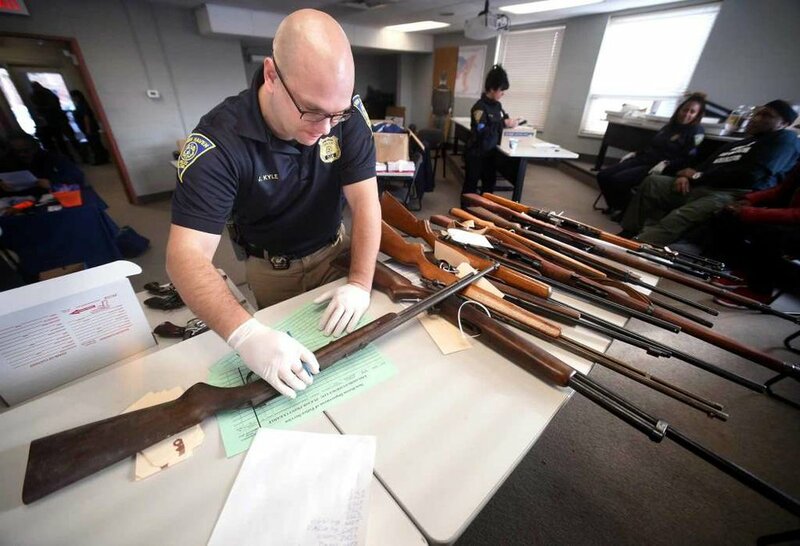 Detectives and officers from the New Haven Police Academy, armorers and Bureau of Identification personnel were responsible for making the weapons turned in safe and test-firing them. Over the next few months prior to a larger gun buy-back event planned for December, the police department and its partners “have pledged to research and hopefully secure funding for future events,” Hartman said. Volunteer photographer Adam Kuhn (left) takes photographs of New Haven Police Officer Jason Salgado making sure a handgun is not loaded during a gun buy-back at the New Haven Police Academy in New Haven on December 16, 2017.